The Occupational Safety and Health Administration (OSHA) and National Oceanic and Atmospheric Administration (NOAA) have been working together on a public education effort aimed at improving the way people prepare for and respond to severe weather. 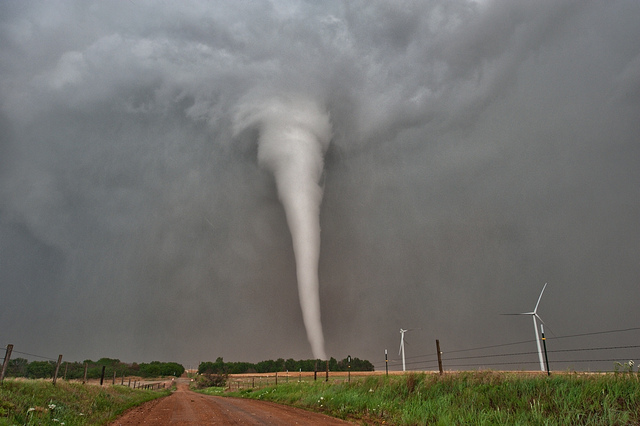 To prepare for a tornado, businesses should develop an emergency plan. The plan should include details on suitable places to take shelter, policies to ensure all personnel are accounted for, and procedures for addressing any hazardous materials that are on-site. It is also recommended that individuals develop action plans for their families. Preparedness involves a continuous process of making plans, ensuring proper equipment is in place, and actively performing training exercises. Planning for tornadoes requires identifying a place to take shelter, being familiar with and monitoring your community’s warning system, and establishing procedures to account for individuals in the building. Employers may need to obtain additional equipment and/or resources (e.g. Emergency Supply Kits) identified in the plan. In addition, workers need to be trained and plans need to be practiced to ensure that personnel are familiar with what to do in the event of a tornado. After a tornado has occurred, as businesses take steps to recover from the storm, workers may face significant hazards including the potential for additional storms, downed electric lines, and sharp debris. Workers should also be aware of hazards from heat stress and from equipment used during response/recovery operations, such as portable generators. Workers will need to take special precautions in order to stay safe during response and recovery operations and as such should be aware of the following: hazardous driving conditions due to slippery and/or blocked roadways; slips and falls due to slippery walkways; falling and flying objects such as tree limbs and utility poles; sharp objects including nails and broken glass; electrical hazards from downed power lines or downed objects in contact with power lines; falls from heights; burns from fires caused by energized line contact or equipment failure; exhaustion from working extended shifts; and heat and dehydration. Click here to learn more about how businesses and their workers can prepare for tornadoes, including employer responsibilities, and to access additional resources and checklists that offer simple ways to make sure you are prepared for a tornado, including suggestions for communications equipment and personal preparedness kits.